Would you like to see your glass surfaces look pristine without squandering time, energy and a great deal of cash? You can achieve this now – just let the experts of window cleaning in Archway manage this chore for you. We guarantee that all parts of your windows are in pristine condition – glass surfaces, frames and window sills. You can be sure that your property is managed with great attention time for free more essential. assignments this is not all – the But to will come to you save time and efforts with along many. We also provide our professional services in nearby areas: Upper Holloway, Holloway Road, Hornsey Rise, Tufnell Park, Crouch End. We provide residential and commercial window cleaning by using sophisticated techniques. You can rely on our professionalism for all types of glass surfaces, skylights and conservatories. For windows placed up to your fourth floor, we use water-fed extension poles. This technique is convenient and allows safe cleaning systems – the poles are connected to the water tank in the vehicle. For higher window surfaces, our rope access solution will grant you fast and great end results. You can benefit from these methods right now – just dial 020 3746 3113 and place an order! You can depend on the abilities and experience of the experts for cleaning all types of windows. The glass surfaces in our proficiency are: single or double windows, bay ones and sash windows. Of course, if you have French doors, garden windows, conservatory or skylights, we will make them spotless, too. With our advanced techniques and latest machinery, we can tackle all types of window cleaning, even with hard-to-reach glass panes. Improve the look of your office – the specialists of commercial window cleaning will deal with that. As part of our distinctive technique, we use water-fed extension poles. With this approach, we can clean completely the exterior of your business premise, as high as the fourth floor. To reach higher windows we use rope access. We make sure your glass panes will look pristine, regardless how highly placed they are. With the assistance of the team of specialists London's skyline will never be dirty. 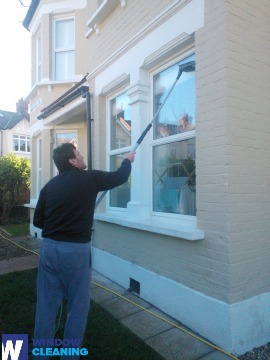 Request our window cleaning in Archway for your house. We will use the same techniques – water fed extension pole system for lower windows and rope access equipment for higher ones. For the whole process we use purified water. Book today – dial 020 3746 3113 and speak with our customer care. Or just fill in our on-site booking form or use our chat option.